Was £50 & now down to £18 with Free C+C but use code TENTS10 & it will reduce the price down to £16.20. 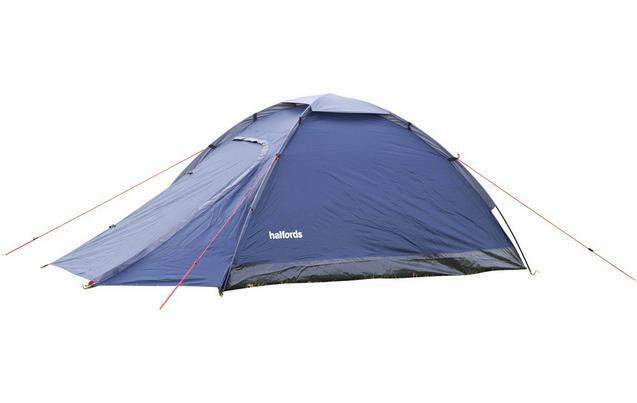 Great for festivals, the Halfords 2 Person XL Dome Tent With Porch provides some extra storage space which is particularly useful for storing those muddy wellies. The dome design has a single skin, making pitching really easy so you have more time to spend enjoying a festival. The 2000hh wouldn't bother me at all, i've used tents with this spec even in heavy rain and they've all been fine. At one time 2000hh or less was the norm. More of an issue will be the condensation, with this being a single skin. I wouldn't buy single skin tents, no matter how cheap they are. Don't try taking this on holiday unless you can GURANTEE your weather. The 2000hh wouldn't bother me at all, i've used tents with this spec even …The 2000hh wouldn't bother me at all, i've used tents with this spec even in heavy rain and they've all been fine. At one time 2000hh or less was the norm.More of an issue will be the condensation, with this being a single skin. I wouldn't buy single skin tents, no matter how cheap they are. Agree with you on this also. i have been camping nearly a year in South America (Patagonia more specifically) weather s good, this s fine. Yes, condensation was an issue!!! In 4 1. Good luck everyone. Wow! Will this work in my back garden as well as Patagonia? I got one of these for Leeds festival a few years ago seemed to keep me dry over night until the morning when I prodded the ceiling, at which point all the condensation came flooding down line a mini rain cloud had formed inside the tent. Not a Man and Woman tent, but a two Man tent! Bought it for under 16 quid over a week ago when Halfords had 15% off. Took it to the beach in Sussex just for a laugh during the days and did its job. I probably wouldn't take it for proper camping for for two days half decent weather, should be fine. For those new to camping, I'd suggest that oyu really take notice of the …For those new to camping, I'd suggest that oyu really take notice of the intending uses... 'waterproof' is a very lose term, and 2000mm HH is really quite low. Anything more than a light rain in a breeze, and you'll likely see water ingress... And unless you sleep on camping mats, you WILL touch the sides and increase any ingress...Don't try taking this on holiday unless you can GURANTEE your weather. Any recommendations for a decent tent that can sleep an adult and child?Looking to get one and take my kids out on wild camping trips on separate occasions.Live in Skipton so should have plenty of spots to pick from near by. I live near Skipton. Loads of places. What sort of price point/spec? Will you be carrying it walking?